Hikaru no Go (ヒカルの碁, literally The Go of Hikaru or Hikaru's Go) is a manga (a Japanese comic) and an anime (a Japanese cartoon) about a boy (Hikaru Shindo) who discovers the ancient game when he finds an old board in the attic and meets the spirit of a past Go master (Fujiwara-no-Sai). Thanks to the comic, Go has come into fashion again with the Japanese youth. Published by the Jump Comics division of Shueisha in Japan, the hilarious storyline is by Yumi Hotta*; the gripping art is by Takeshi Obata; and photogenic pro 5-dan Yukari Umezawa (Umezawa Yukari) gets credited for go technical advice. The series was serialized in Weekly Shonen Jump, a popular Japanese manga magazine. The anime was produced by Studio Pierrot and it was aired on TV Tokyo from 2001 to 2003. New Years' specials were aired in January 2003 and January 2004. 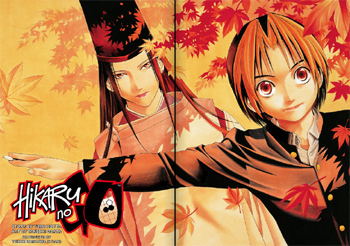 The Hikaru no Go manga is published by VIZ Media ( http://www.viz.com) in the United States and Canada, and the Hikaru no Go anime has been licensed by VIZ Media in the United States and Canada. The manga is serialized in the United States version of Shonen Jump ( http://www.shonenjump.com), while the entire anime is viewable at Hulu. In North America Hikaru no Go is also available on the ImaginAsian TV Channel. 'Hikaru no Go'' is often nicknamed "Hikago" (ヒカ碁). "World Go population probably tripled because of 'Hikaru no Go'", said Joey Hung, USA 8 dan Go instructor. All of Joey's Go School Go students in Fremont, CA, USA have watched the exciting Go anime. Also, at the World Amateur Go Tournament and Beijing Mental Olympics Tournament, many European, South American and Asian players reflected that they have seen a dramatic increase in Go population due to the 'Hikaru no GO' anime. Many Asian countries, Japan included, place the person's family name before their given name, for example Go Seigen. Sensei's Library uses the Asian ordering exclusively (see Japanese name). However, this page and other Hikaru no Go pages use given name first, family name last ordering for most of the characters to be consistent with Hikaru no Go manga published in the United States, Canada, France, Italy and Germany. It is hoped that this choice will facilitate the use of Sensei's Library by individuals for whom reading the manga is their first exposure to Go. The manga uses Western order naming with modern-day individuals and Japanese naming with historical figures. Perhaps the most prominent example of the historical figure naming is Murasaki Shikibu (Asian order) in place of Shikibu Murasaki (Western order). Murasaki Shikibu is the author of the famous Japanese novel The Tale of Genji. Chinese individuals (such as Lee Rinshin) have their names rendered in Asian order in the English-language version of Hikaru no Go (see Chinese name). In the beginning of the English editions Korean individuals (such as Suyong Hong) have their names rendered in Western order but towards the end they are using Asian order (see Korean name). In one scene in the English-language Volume 7, several characters are introduced at a Go ceremony in Japanese order - VIZ Media added the note that professional Japanese Go players are known in family name first order, even outside of Japan. Names of seiyu (voice actors) and all staff members involved (except for Umezawa Yukari) are also in the Western order. Towards the end of the English manga, the translators seem to revert to Asian naming order. This change happens somewhat gradually. In Volume 17, Chapter 141, the pairings for the first round of the Meijin Tournament are shown as "Shindo Hikaru (Asian order) Shodan vs. Akira Toya (Western order) 3dan." Hikaru Shindo (進藤 ヒカル Shindō Hikaru) - Protagonist who is assisted by Sai and later becomes a very powerfull go player due to sai's teachings surprising the entire go comunity with his seemingly impossibly fast improvement rate scaring/intriguing many of the high ranking players. also the only person who can see and interact with sai. Fujiwara-no-Sai (藤原佐為) - A spirit who does not wish to stop playing Go and the mentor of Hikaru Shindo. Sai wants to play the divine move (a.k.a. the Hand of God). In the manga and anime, Sai had possessed the real-life figure Hon'inbo Shusaku and through his body, became the world`s best go player of all time. Extremely effeminate by today's standards, Sai is often drawn with traditionally feminine features and mannerisms, and many fans sometimes mistakenly call him a "she" in passing only to correct themselves after realizing their mistake. Akira Toya (塔矢 アキラ Tōya Akira) - Hikaru's biggest rival and Kaio Middle School student. Akira is already a very strong player when Hikaru first begins playing. Akira is amazed by Hikaru's seemingly impossible strength. Since his first game with Hikaru, Akira has been obsessed with discovering the secret behind Hikaru's strength. Akari Fujisaki (藤崎 あかり Fujisaki Akari) - Hikaru's childhood friend. She begins to learn Go as well when Hikaru becomes interested and later joins the Haze Middle School Go club, serving as captain of the girls' team. Yuki Mitani (三谷 祐輝 Mitani Yūki) - A player at the Go Club at Haze Middle School who overcomes his cheating habit. Tetsuo Kaga (加賀 鉄男 Kaga Tetsuo) - President of Haze Middle School's Shogi club. Tetsuo hates Go because he likes Shogi better and because Akira is better than he is, yet he still plays Go from time to time to keep his skills limber. Tetsuo smokes cigarettes, which were kept in the earlier U.S. Shonen Jump versions of Hikaru no Go, but were removed from the U.S. graphic novels and the later (as of 2005) Shonen Jump versions. Kimihiro Tsutsui (筒井 公宏 Tsutsui Kimihiro) - Optimistic nerd who relies on a strategy book. Kimihiro is the founder of Haze Middle School's Go club. More of a strategist than a real player, Kimihiro prefers the intellectual pursuits of Go more than its nature as a game. Toya Meijin (塔矢 名人 Tōya Meijin) - Akira Toya's father. His real name is Koyo Toya (塔矢 行洋 Tōya Kōyō); Meijin is a title he received for defeating the best Go players in Japan. Yoshitaka Waya (和谷 義高 Waya Yoshitaka) - Hikaru's "big brother" insei. Shinichiro Isumi (伊角 慎一郎 Isumi Shin'ichirō) - Insei that has a lot of self doubt during the Go professional examination. Kosuke Ochi (越智 康介 Ochi Kōsuke) - Spoiled brat that Akira tutors so Akira can test Hikaru's strength. Kaoru Kishimoto (岸本 薫 Kishimoto Kaoru) - Kaio Middle School Go club chief and former insei who did not become a professional. Kishimoto reads the opponent's habits and weaknesses and attack them directly. His way of speaking and carrying himself do not resemble those of a 9th grader. As an insei, he was known more for drinking black coffee than his Go ability. Kishimoto likes to drink black coffee as he did when he was an insei. Kishimoto's name is similar to the name of a real life Go player named Iwamoto Kaoru (岩本 薫 Iwamoto Kaoru). Kuwabara Hon'inbo (桑原本因坊 Kuwabara Hon'inbō) - The current holder of the Hon'inbo title in Hikaru no Go. Kuwabara is friends with Toya Meijin. Haze Middle School (葉瀬中学校 Haze Chūgakkō) - The school that Hikaru, Kimihiro, Tetsuo, Akari, and Yuki attend. Haze Middle School has a small upstart Go club that was founded by Kimihiro. Haze's name means "goby." Kaio Middle School (海王中学校 Kaiō Chūgakkō) - The school that Akira attends. Kaio has a highly-rated Go club that has many members. Kaio's name means "king of the seas." The Japan Go Association (日本棋院 Nihon Ki-in) - The headquarters of the Japan Go Association is located in Tokyo, and many of the characters go to the building for Go matches and other events. Hikaru No Go Junkie : Some readers of the comic are in denial about becoming a junkie. Japanese Big Question Mark - If you have questions about the manga in Japanese, post them here. Sensei's Library has a separate shelf devoted to the study of the various go problems and interesting game positions that appear in the manga. Some (if not all) of the game positions that appear in Hikaru are from real games played by professionals. Can you add to the list of identified? errors, mistakes, glitches found in the manga, anime, etc. forgot the names of the chapters? Want to know who sells what? 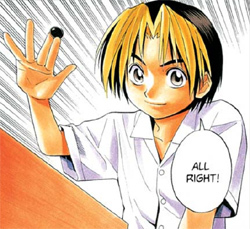 The English-language version of Hikaru no Go retains usage of many Japanese Go-related phrases, such as Onegaishimasu and Yoroshiku Onegaishimasu. In addition, the word "Yugen no Ma" is retained. The name of Hikarunix, a Go-themed operating system, was inspired by Hikaru no Go.